All you need is a camera (it would be great if it was a Polaroid, so you would get the pictures right away!) and a scrapbook (or a photo album, or a 3-ring binder...). Every time you find new and great combinations in your wardrobe, take a picture of yourself wearing those items. And add it to your scrapbook. It works wonders when you can't think of anything to wear, or when you are too tired to think in the morning. Or even better, when you can point to page 11 and ask your little sister to get the relevant pieces out of your closet, and lay them neatly on your bed for you. 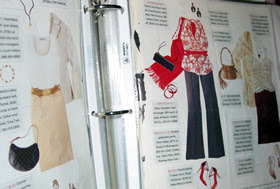 I keep a separate section for inspirational outfits from fashion magazines, too. I also used to have a book like this. But one day someone mixed up all the combinationationa ! My god I asked my sister to put toghether pieces ofpag. 12. I dressed up quickly and went out. My god ! My neighbours are still laughing at me. don't you look in a mirror before you leave? love, love love this idea!